Get the reliable OEM ink that will truly make a difference in your document quality. With rich black printing and clear grayscale reproduction, you'll appreciate the professional results on every page. Designed to maximize the efficiency of your machine. Device Types: Inkjet Printer; Color(s): Yellow; Page-Yield: 600; Supply Type: Ink. 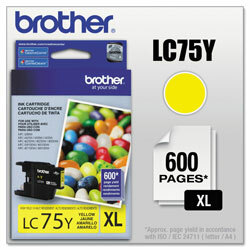 Yellow Inkjet Printer Cartridges from Brother! 357 In Stock today.